OpenWeigh have today released our first third party integration targeting the Sage One online accounts suite of software. This integration will bring us the first full accounts integration for the OpenWeigh weighbridge software package. 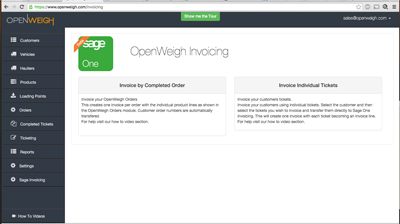 The new Sage One link will speed up invoicing for users of OpenWeigh and has two distinct invoicing methods. OpenWeigh subscribers with a Small Business subsection can now integrate SageOne online accounts directly with their OpenWeigh Software. Individual tickets can be sent straight to Sage for invoicing creating an itemised invoice with ticket details embedded. Alternatively users of the OpenWeigh orders module can send each order directly to SageOne at the push of a button. This represents another feature that has been rolled out to OpenWeigh customers at no additional charge and marks the start of a series of integrators we had planned for 2016.